If the reactions that compose the stress response are chronic or if they frequently exceed normal ranges, they can lead to cumulative wear and tear on the body, in much the same way that running your air conditioner on full blast all summer will eventually cause wear and tear on it. For example, the high blood pressure that a person under considerable job strain experiences might eventually take a toll on his heart and set the stage for a heart attack or heart failure. Also, someone exposed to high levels of the stress hormone cortisol might become vulnerable to infection or disease because of weakened immune system functioning (McEwen, 1998). Robert Sapolsky, a noted Stanford University neurobiologist and professor, has for over 30 years conducted extensive research on stress, its impact on our bodies, and how psychological tumult can escalate stress—even in baboons. Here are two videos featuring Dr. Sapolsky: one is regarding killer stress and the other is an excellent in-depth documentary from National Geographic. Physical disorders or diseases whose symptoms are brought about or worsened by stress and emotional factors are called psychophysiological disorders. The physical symptoms of psychophysiological disorders are real and they can be produced or exacerbated by psychological factors (hence the psycho and physiological in psychophysiological). A list of frequently encountered psychophysiological disorders is provided in [link]. In addition to stress itself, emotional upset and certain stressful personality traits have been proposed as potential contributors to ill health. Franz Alexander (1950), an early-20th-century psychoanalyst and physician, once postulated that various diseases are caused by specific unconscious conflicts. For example, he linked hypertension to repressed anger, asthma to separation anxiety, and ulcers to an unconscious desire to “remain in the dependent infantile situation—to be loved and cared for” (Alexander, 1950, p. 102). Although hypertension does appear to be linked to anger (as you will learn below), Alexander’s assertions have not been supported by research. Years later, Friedman and Booth-Kewley (1987), after statistically reviewing 101 studies examining the link between personality and illness, proposed the existence of disease-prone personality characteristics, including depression, anger/hostility, and anxiety. Indeed, a study of over 61,000 Norwegians identified depression as a risk factor for all major disease-related causes of death (Mykletun et al., 2007). In addition, neuroticism—a personality trait that reflects how anxious, moody, and sad one is—has been identified as a risk factor for chronic health problems and mortality (Ploubidis & Grundy, 2009). In a sense, the immune system is the body’s surveillance system. It consists of a variety of structures, cells, and mechanisms that serve to protect the body from invading toxins and microorganisms that can harm or damage the body’s tissues and organs. When the immune system is working as it should, it keeps us healthy and disease free by eliminating bacteria, viruses, and other foreign substances that have entered the body (Everly & Lating, 2002). In addition, the immune system may sometimes break down and be unable to do its job. This situation is referred to as immunosuppression, the decreased effectiveness of the immune system. When people experience immunosuppression, they become susceptible to any number of infections, illness, and diseases. For example, acquired immune deficiency syndrome (AIDS) is a serious and lethal disease that is caused by human immunodeficiency virus (HIV), which greatly weakens the immune system by infecting and destroying antibody-producing cells, thus rendering a person vulnerable to any of a number of opportunistic infections (Powell, 1996). Some of the most compelling evidence for a connection between the brain and the immune system comes from studies in which researchers demonstrated that immune responses in animals could be classically conditioned (Everly & Lating, 2002). For example, Ader and Cohen (1975) paired flavored water (the conditioned stimulus) with the presentation of an immunosuppressive drug (the unconditioned stimulus), causing sickness (an unconditioned response). Not surprisingly, rats exposed to this pairing developed a conditioned aversion to the flavored water. However, the taste of the water itself later produced immunosuppression (a conditioned response), indicating that the immune system itself had been conditioned. Many subsequent studies over the years have further demonstrated that immune responses can be classically conditioned in both animals and humans (Ader & Cohen, 2001). Thus, if classical conditioning can alter immunity, other psychological factors should be capable of altering it as well. Hundreds of studies involving tens of thousands of participants have tested many kinds of brief and chronic stressors and their effect on the immune system (e.g., public speaking, medical school examinations, unemployment, marital discord, divorce, death of spouse, burnout and job strain, caring for a relative with Alzheimer’s disease, and exposure to the harsh climate of Antarctica). It has been repeatedly demonstrated that many kinds of stressors are associated with poor or weakened immune functioning (Glaser & Kiecolt-Glaser, 2005; Kiecolt-Glaser, McGuire, Robles, & Glaser, 2002; Segerstrom & Miller, 2004). When evaluating these findings, it is important to remember that there is a tangible physiological connection between the brain and the immune system. For example, the sympathetic nervous system innervates immune organs such as the thymus, bone marrow, spleen, and even lymph nodes (Maier, Watkins, & Fleshner, 1994). Also, we noted earlier that stress hormones released during hypothalamic-pituitary-adrenal (HPA) axis activation can adversely impact immune function. One way they do this is by inhibiting the production of lymphocytes, white blood cells that circulate in the body’s fluids that are important in the immune response (Everly & Lating, 2002). Some of the more dramatic examples demonstrating the link between stress and impaired immune function involve studies in which volunteers were exposed to viruses. The rationale behind this research is that because stress weakens the immune system, people with high stress levels should be more likely to develop an illness compared to those under little stress. In one memorable experiment using this method, researchers interviewed 276 healthy volunteers about recent stressful experiences (Cohen et al., 1998). Following the interview, these participants were given nasal drops containing the cold virus (in case you are wondering why anybody would ever want to participate in a study in which they are subjected to such treatment, the participants were paid $800 for their trouble). When examined later, participants who reported experiencing chronic stressors for more than one month—especially enduring difficulties involving work or relationships—were considerably more likely to have developed colds than were participants who reported no chronic stressors ([link]). 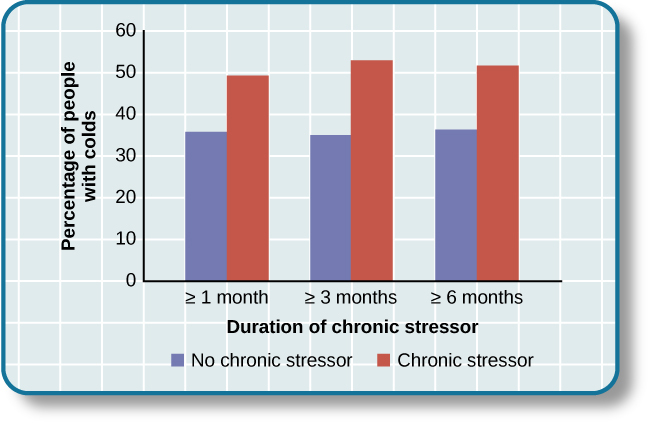 This graph shows the percentages of participants who developed colds (after receiving the cold virus) after reporting having experienced chronic stressors lasting at least one month, three months, and six months (adapted from Cohen et al., 1998). In another study, older volunteers were given an influenza virus vaccination. Compared to controls, those who were caring for a spouse with Alzheimer’s disease (and thus were under chronic stress) showed poorer antibody response following the vaccination (Kiecolt-Glaser, Glaser, Gravenstein, Malarkey, & Sheridan, 1996). Other studies have demonstrated that stress slows down wound healing by impairing immune responses important to wound repair (Glaser & Kiecolt-Glaser, 2005). In one study, for example, skin blisters were induced on the forearm. Subjects who reported higher levels of stress produced lower levels of immune proteins necessary for wound healing (Glaser et al., 1999). Stress, then, is not so much the sword that kills the knight, so to speak; rather, it’s the sword that breaks the knight’s shield, and your immune system is that shield. Have you ever wondered why people who are stressed often seem to have a haggard look about them? A pioneering study from 2004 suggests that the reason is because stress can actually accelerate the cell biology of aging. Stress, it seems, can shorten telomeres, which are segments of DNA that protect the ends of chromosomes. Shortened telomeres can inhibit or block cell division, which includes growth and proliferation of new cells, thereby leading to more rapid aging (Sapolsky, 2004). In the study, researchers compared telomere lengths in the white blood cells in mothers of chronically ill children to those of mothers of healthy children (Epel et al., 2004). Mothers of chronically ill children would be expected to experience more stress than would mothers of healthy children. The longer a mother had spent caring for her ill child, the shorter her telomeres (the correlation between years of caregiving and telomere length was r = -.40). In addition, higher levels of perceived stress were negatively correlated with telomere size (r = -.31). These researchers also found that the average telomere length of the most stressed mothers, compared to the least stressed, was similar to what you would find in people who were 9–17 years older than they were on average. Numerous other studies since have continued to find associations between stress and eroded telomeres (Blackburn & Epel, 2012). Some studies have even demonstrated that stress can begin to erode telomeres in childhood and perhaps even before children are born. For example, childhood exposure to violence (e.g., maternal domestic violence, bullying victimization, and physical maltreatment) was found in one study to accelerate telomere erosion from ages 5 to 10 (Shalev et al., 2013). Another study reported that young adults whose mothers had experienced severe stress during their pregnancy had shorter telomeres than did those whose mothers had stress-free and uneventful pregnancies (Entringer et al., 2011). Further, the corrosive effects of childhood stress on telomeres can extend into young adulthood. In an investigation of over 4,000 U.K. women ages 41–80, adverse experiences during childhood (e.g., physical abuse, being sent away from home, and parent divorce) were associated with shortened telomere length (Surtees et al., 2010), and telomere size decreased as the amount of experienced adversity increased ([link]). Telomeres are shorter in adults who experienced more trauma as children (adapted from Blackburn & Epel, 2012). Efforts to dissect the precise cellular and physiological mechanisms linking short telomeres to stress and disease are currently underway. For the time being, telomeres provide us with yet another reminder that stress, especially during early life, can be just as harmful to our health as smoking or fast food (Blackburn & Epel, 2012). The cardiovascular system is composed of the heart and blood circulation system. For many years, disorders that involve the cardiovascular system—known as cardiovascular disorders—have been a major focal point in the study of psychophysiological disorders because of the cardiovascular system’s centrality in the stress response (Everly & Lating, 2002). Heart disease is one such condition. Each year, heart disease causes approximately one in three deaths in the United States, and it is the leading cause of death in the developed world (Centers for Disease Control and Prevention [CDC], 2011; Shapiro, 2005). The symptoms of heart disease vary somewhat depending on the specific kind of heart disease one has, but they generally involve angina—chest pains or discomfort that occur when the heart does not receive enough blood (Office on Women’s Health, 2009). The pain often feels like the chest is being pressed or squeezed; burning sensations in the chest and shortness of breath are also commonly reported. Such pain and discomfort can spread to the arms, neck, jaws, stomach (as nausea), and back (American Heart Association [AHA], 2012a) ([link]). 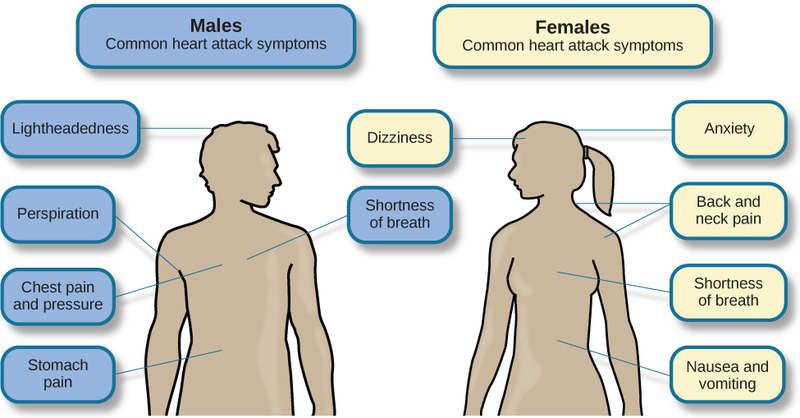 Males and females often experience different symptoms of a heart attack. A major risk factor for heart disease is hypertension, which is high blood pressure. Hypertension forces a person’s heart to pump harder, thus putting more physical strain on the heart. If left unchecked, hypertension can lead to a heart attack, stroke, or heart failure; it can also lead to kidney failure and blindness. Hypertension is a serious cardiovascular disorder, and it is sometimes called the silent killer because it has no symptoms—one who has high blood pressure may not even be aware of it (AHA, 2012b). Many risk factors contributing to cardiovascular disorders have been identified. These risk factors include social determinants such as aging, income, education, and employment status, as well as behavioral risk factors that include unhealthy diet, tobacco use, physical inactivity, and excessive alcohol consumption; obesity and diabetes are additional risk factors (World Health Organization [WHO], 2013). Over the past few decades, there has been much greater recognition and awareness of the importance of stress and other psychological factors in cardiovascular health (Nusair, Al-dadah, & Kumar, 2012). Indeed, exposure to stressors of many kinds has also been linked to cardiovascular problems; in the case of hypertension, some of these stressors include job strain (Trudel, Brisson, & Milot, 2010), natural disasters (Saito, Kim, Maekawa, Ikeda, & Yokoyama, 1997), marital conflict (Nealey-Moore, Smith, Uchino, Hawkins, & Olson-Cerny, 2007), and exposure to high traffic noise levels at one’s home (de Kluizenaar, Gansevoort, Miedema, & de Jong, 2007). Perceived discrimination appears to be associated with hypertension among African Americans (Sims et al., 2012). In addition, laboratory-based stress tasks, such as performing mental arithmetic under time pressure, immersing one’s hand into ice water (known as the cold pressor test), mirror tracing, and public speaking have all been shown to elevate blood pressure (Phillips, 2011). Sometimes research ideas and theories emerge from seemingly trivial observations. In the 1950s, cardiologist Meyer Friedman was looking over his waiting room furniture, which consisted of upholstered chairs with armrests. Friedman decided to have these chairs reupholstered. When the man doing the reupholstering came to the office to do the work, he commented on how the chairs were worn in a unique manner—the front edges of the cushions were worn down, as were the front tips of the arm rests. It seemed like the cardiology patients were tapping or squeezing the front of the armrests, as well as literally sitting on the edge of their seats (Friedman & Rosenman, 1974). Were cardiology patients somehow different than other types of patients? If so, how? After researching this matter, Friedman and his colleague, Ray Rosenman, came to understand that people who are prone to heart disease tend to think, feel, and act differently than those who are not. These individuals tend to be intensively driven workaholics who are preoccupied with deadlines and always seem to be in a rush. According to Friedman and Rosenman, these individuals exhibit Type A behavior pattern; those who are more relaxed and laid-back were characterized as Type B ([link]). In a sample of Type As and Type Bs, Friedman and Rosenman were startled to discover that heart disease was over seven times more frequent among the Type As than the Type Bs (Friedman & Rosenman, 1959). The major components of the Type A pattern include an aggressive and chronic struggle to achieve more and more in less and less time (Friedman & Rosenman, 1974). Specific characteristics of the Type A pattern include an excessive competitive drive, chronic sense of time urgency, impatience, and hostility toward others (particularly those who get in the person’s way). By the 1970s, a majority of practicing cardiologists believed that Type A behavior pattern was a significant risk factor for heart disease (Friedman, 1977). Indeed, a number of early longitudinal investigations demonstrated a link between Type A behavior pattern and later development of heart disease (Rosenman et al., 1975; Haynes, Feinleib, & Kannel, 1980). Extensive research clearly suggests that the anger/hostility dimension of Type A behavior pattern may be one of the most important factors in the development of heart disease. This relationship was initially described in the Haynes et al. (1980) study mentioned above: Suppressed hostility was found to substantially elevate the risk of heart disease for both men and women. Also, one investigation followed over 1,000 male medical students from 32 to 48 years. At the beginning of the study, these men completed a questionnaire assessing how they react to pressure; some indicated that they respond with high levels of anger, whereas others indicated that they respond with less anger. Decades later, researchers found that those who earlier had indicated the highest levels of anger were over 6 times more likely than those who indicated less anger to have had a heart attack by age 55, and they were 3.5 times more likely to have experienced heart disease by the same age (Chang, Ford, Meoni, Wang, & Klag, 2002). From a health standpoint, it clearly does not pay to be an angry young person. After reviewing and statistically summarizing 35 studies from 1983 to 2006, Chida and Steptoe (2009) concluded that the bulk of the evidence suggests that anger and hostility constitute serious long-term risk factors for adverse cardiovascular outcomes among both healthy individuals and those already suffering from heart disease. One reason angry and hostile moods might contribute to cardiovascular diseases is that such moods can create social strain, mainly in the form of antagonistic social encounters with others. This strain could then lay the foundation for disease-promoting cardiovascular responses among hostile individuals (Vella, Kamarck, Flory, & Manuck, 2012). In this transactional model, hostility and social strain form a cycle ([link]). 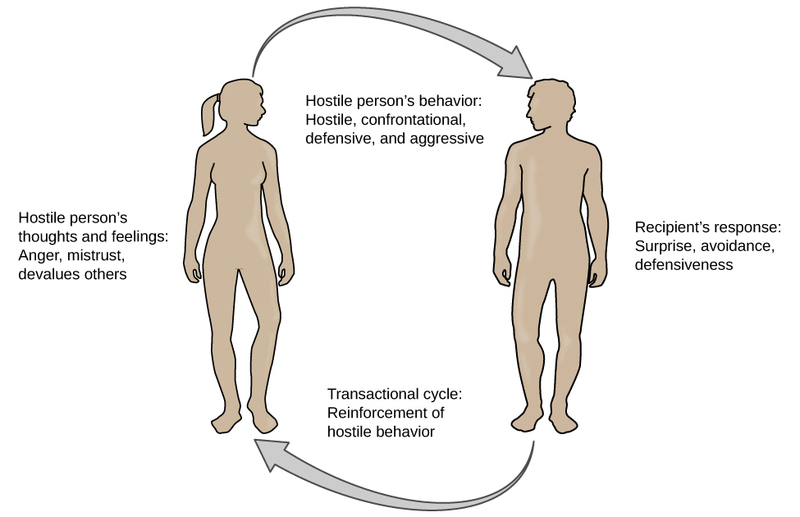 According to the transactional model of hostility for predicting social interactions (Vella et al., 2012), the thoughts and feelings of a hostile person promote antagonistic behavior toward others, which in turn reinforces complimentary reactions from others, thereby intensifying ones’ hostile disposition and intensifying the cyclical nature of this relationship. In addition to anger and hostility, a number of other negative emotional states have been linked with heart disease, including negative affectivity and depression (Suls & Bunde, 2005). Negative affectivity is a tendency to experience distressed emotional states involving anger, contempt, disgust, guilt, fear, and nervousness (Watson, Clark, & Tellegen, 1988). It has been linked with the development of both hypertension and heart disease. For example, over 3,000 initially healthy participants in one study were tracked longitudinally, up to 22 years. Those with higher levels of negative affectivity at the time the study began were substantially more likely to develop and be treated for hypertension during the ensuing years than were those with lower levels of negative affectivity (Jonas & Lando, 2000). In addition, a study of over 10,000 middle-aged London-based civil servants who were followed an average of 12.5 years revealed that those who earlier had scored in the upper third on a test of negative affectivity were 32% more likely to have experienced heart disease, heart attack, or angina over a period of years than were those who scored in the lowest third (Nabi, Kivimaki, De Vogli, Marmot, & Singh-Manoux, 2008). Hence, negative affectivity appears to be a potentially vital risk factor for the development of cardiovascular disorders. For centuries, poets and folklore have asserted that there is a connection between moods and the heart (Glassman & Shapiro, 1998). You are no doubt familiar with the notion of a broken heart following a disappointing or depressing event and have encountered that notion in songs, films, and literature. Perhaps the first to recognize the link between depression and heart disease was Benjamin Malzberg (1937), who found that the death rate among institutionalized patients with melancholia (an archaic term for depression) was six times higher than that of the population. A classic study in the late 1970s looked at over 8,000 manic-depressive persons in Denmark, finding a nearly 50% increase in deaths from heart disease among these patients compared with the general Danish population (Weeke, 1979). By the early 1990s, evidence began to accumulate showing that depressed individuals who were followed for long periods of time were at increased risk for heart disease and cardiac death (Glassman, 2007). In one investigation of over 700 Denmark residents, those with the highest depression scores were 71% more likely to have experienced a heart attack than were those with lower depression scores (Barefoot & Schroll, 1996). [link] illustrates the gradation in risk of heart attacks for both men and women. 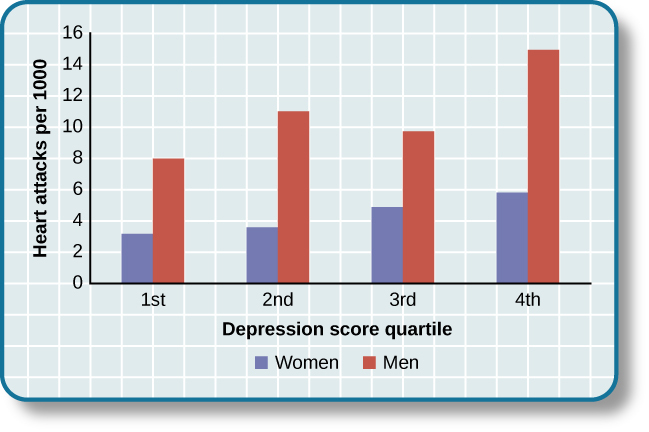 This graph shows the incidence of heart attacks among men and women by depression score quartile (adapted from Barefoot & Schroll, 1996). In one study, death rates from cardiovascular problems was substantially higher in depressed people; depressed men were 50% more likely to have died from cardiovascular problems, and depressed women were 70% more likely (Ösby, Brandt, Correia, Ekbom, & Sparén, 2001). A statistical review of 10 longitudinal studies involving initially healthy individuals revealed that those with elevated depressive symptoms have, on average, a 64% greater risk of developing heart disease than do those with fewer symptoms (Wulsin & Singal, 2003). A study of over 63,000 registered nurses found that those with more depressed symptoms when the study began were 49% more likely to experience fatal heart disease over a 12-year period (Whang et al., 2009). The American Heart Association, fully aware of the established importance of depression in cardiovascular diseases, several years ago recommended routine depression screening for all heart disease patients (Lichtman et al., 2008). Recently, they have recommended including depression as a risk factor for heart disease patients (AHA, 2014). Although the exact mechanisms through which depression might produce heart problems have not been fully clarified, a recent investigation examining this connection in early life has shed some light. In an ongoing study of childhood depression, adolescents who had been diagnosed with depression as children were more likely to be obese, smoke, and be physically inactive than were those who had not received this diagnosis (Rottenberg et al., 2014). One implication of this study is that depression, especially if it occurs early in life, may increase the likelihood of living an unhealthy lifestyle, thereby predisposing people to an unfavorable cardiovascular disease risk profile. It is important to point out that depression may be just one piece of the emotional puzzle in elevating the risk for heart disease, and that chronically experiencing several negative emotional states may be especially important. A longitudinal investigation of Vietnam War veterans found that depression, anxiety, hostility, and trait anger each independently predicted the onset of heart disease (Boyle, Michalek, & Suarez, 2006). However, when each of these negative psychological attributes was combined into a single variable, this new variable (which researchers called psychological risk factor) predicted heart disease more strongly than any of the individual variables. Thus, rather than examining the predictive power of isolated psychological risk factors, it seems crucial for future researchers to examine the effects of combined and more general negative emotional and psychological traits in the development of cardiovascular illnesses. Asthma is a chronic and serious disease in which the airways of the respiratory system become obstructed, leading to great difficulty expelling air from the lungs. 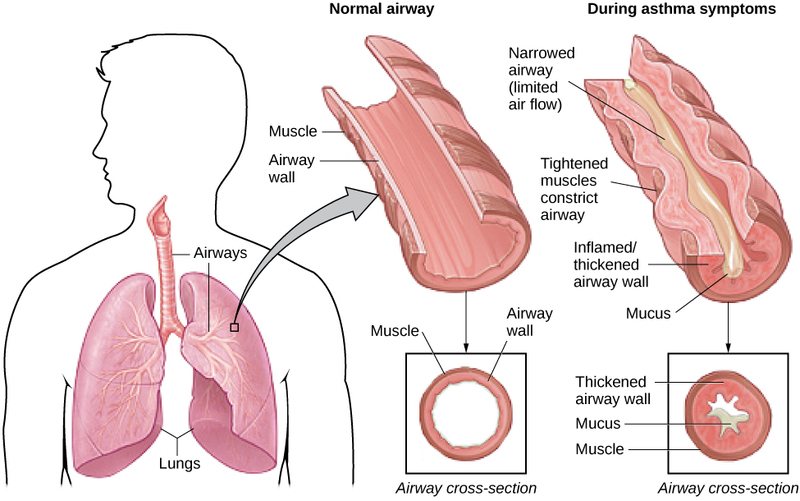 The airway obstruction is caused by inflammation of the airways (leading to thickening of the airway walls) and a tightening of the muscles around them, resulting in a narrowing of the airways ([link]) (American Lung Association, 2010). Because airways become obstructed, a person with asthma will sometimes have great difficulty breathing and will experience repeated episodes of wheezing, chest tightness, shortness of breath, and coughing, the latter occurring mostly during the morning and night (CDC, 2006). In asthma, the airways become inflamed and narrowed. According to the Centers for Disease Control and Prevention (CDC), around 4,000 people die each year from asthma-related causes, and asthma is a contributing factor to another 7,000 deaths each year (CDC, 2013a). The CDC has revealed that asthma affects 18.7 million U.S. adults and is more common among people with lower education and income levels (CDC, 2013b). Especially concerning is that asthma is on the rise, with rates of asthma increasing 157% between 2000 and 2010 (CDC, 2013b). Asthma attacks are acute episodes in which an asthma sufferer experiences the full range of symptoms. Asthma exacerbation is often triggered by environmental factors, such as air pollution, allergens (e.g., pollen, mold, and pet hairs), cigarette smoke, airway infections, cold air or a sudden change in temperature, and exercise (CDC, 2013b). Psychological factors appear to play an important role in asthma (Wright, Rodriguez, & Cohen, 1998), although some believe that psychological factors serve as potential triggers in only a subset of asthma patients (Ritz, Steptoe, Bobb, Harris, & Edwards, 2006). Many studies over the years have demonstrated that some people with asthma will experience asthma-like symptoms if they expect to experience such symptoms, such as when breathing an inert substance that they (falsely) believe will lead to airway obstruction (Sodergren & Hyland, 1999). As stress and emotions directly affect immune and respiratory functions, psychological factors likely serve as one of the most common triggers of asthma exacerbation (Trueba & Ritz, 2013). People with asthma tend to report and display a high level of negative emotions such as anxiety, and asthma attacks have been linked to periods of high emotionality (Lehrer, Isenberg, & Hochron, 1993). In addition, high levels of emotional distress during both laboratory tasks and daily life have been found to negatively affect airway function and can produce asthma-like symptoms in people with asthma (von Leupoldt, Ehnes, & Dahme, 2006). In one investigation, 20 adults with asthma wore preprogrammed wristwatches that signaled them to breathe into a portable device that measures airway function. Results showed that higher levels of negative emotions and stress were associated with increased airway obstruction and self-reported asthma symptoms (Smyth, Soefer, Hurewitz, Kliment, & Stone, 1999). In addition, D’Amato, Liccardi, Cecchi, Pellegrino, & D’Amato (2010) described a case study of an 18-year-old man with asthma whose girlfriend had broken up with him, leaving him in a depressed state. She had also unfriended him on Facebook , while friending other young males. Eventually, the young man was able to “friend” her once again and could monitor her activity through Facebook. Subsequently, he would experience asthma symptoms whenever he logged on and accessed her profile. When he later resigned not to use Facebook any longer, the asthma attacks stopped. This case suggests that the use of Facebook and other forms of social media may represent a new source of stress—it may be a triggering factor for asthma attacks, especially in depressed asthmatic individuals. Exposure to stressful experiences, particularly those that involve parental or interpersonal conflicts, has been linked to the development of asthma throughout the lifespan. A longitudinal study of 145 children found that parenting difficulties during the first year of life increased the chances that the child developed asthma by 107% (Klinnert et al., 2001). In addition, a cross-sectional study of over 10,000 Finnish college students found that high rates of parent or personal conflicts (e.g., parental divorce, separation from spouse, or severe conflicts in other long-term relationships) increased the risk of asthma onset (Kilpeläinen, Koskenvuo, Helenius, & Terho, 2002). Further, a study of over 4,000 middle-aged men who were interviewed in the early 1990s and again a decade later found that breaking off an important life partnership (e.g., divorce or breaking off relationship from parents) increased the risk of developing asthma by 124% over the time of the study (Loerbroks, Apfelbacher, Thayer, Debling, & Stürmer, 2009). A headache is a continuous pain anywhere in the head and neck region. Migraine headaches are a type of headache thought to be caused by blood vessel swelling and increased blood flow (McIntosh, 2013). Migraines are characterized by severe pain on one or both sides of the head, an upset stomach, and disturbed vision. They are more frequently experienced by women than by men (American Academy of Neurology, 2014). Tension headaches are triggered by tightening/tensing of facial and neck muscles; they are the most commonly experienced kind of headache, accounting for about 42% of all headaches worldwide (Stovner et al., 2007). In the United States, well over one-third of the population experiences tension headaches each year, and 2–3% of the population suffers from chronic tension headaches (Schwartz, Stewart, Simon, & Lipton, 1998). A number of factors can contribute to tension headaches, including sleep deprivation, skipping meals, eye strain, overexertion, muscular tension caused by poor posture, and stress (MedicineNet, 2013). Although there is uncertainty regarding the exact mechanisms through which stress can produce tension headaches, stress has been demonstrated to increase sensitivity to pain (Caceres & Burns, 1997; Logan et al., 2001). In general, tension headache sufferers, compared to non-sufferers, have a lower threshold for and greater sensitivity to pain (Ukestad & Wittrock, 1996), and they report greater levels of subjective stress when faced with a stressor (Myers, Wittrock, & Foreman, 1998). 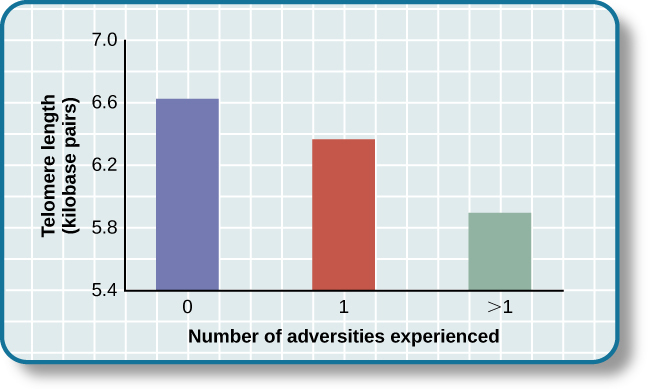 Thus, stress may contribute to tension headaches by increasing pain sensitivity in already-sensitive pain pathways in tension headache sufferers (Cathcart, Petkov, & Pritchard, 2008). Psychophysiological disorders are physical diseases that are either brought about or worsened by stress and other emotional factors. One of the mechanisms through which stress and emotional factors can influence the development of these diseases is by adversely affecting the body’s immune system. A number of studies have demonstrated that stress weakens the functioning of the immune system. Cardiovascular disorders are serious medical conditions that have been consistently shown to be influenced by stress and negative emotions, such as anger, negative affectivity, and depression. Other psychophysiological disorders that are known to be influenced by stress and emotional factors include asthma and tension headaches. Stress and Illness by OpenStaxCollege is licensed under a Creative Commons Attribution 4.0 International License, except where otherwise noted.